1. The number one factor affecting the gold bullion coins prices today and always is the spot price of this precious metal. If you make a habit of monitoring gold bullion coins prices, you will notice that they don’t only fluctuate every day but sometimes several times throughout the day to reflect the actual value of the metal. Since the main goal of precious metals investing is benefiting from the actual metal content, you would like to search for bullion products that are priced as close as possible to the spot price of gold. 2. Investor demand is another important factor that greatly influences the gold bullion coins prices. If you compare Canadian Gold Maple Leaf and American Gold Eagle bullion coins, you will realize that while they have the same precious metal content, the American Eagles are more popular among investors thus dictating the higher price for them. Some investors recommend buying less popular bullion choices since you are buying them for the sake of their physical metal content and you need to minimize any possible transaction costs that might come along the way. 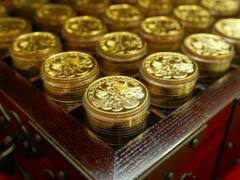 Gold coin dealers always sell more demanded bullion coins at higher prices. 3. Dealer premium is another important factor that can significantly drive gold bullion coins prices up or down depending on the type of coins you are buying. Purely for investment purposes the general rule is to stay away from really popular bullion products like Australian Gold Kangaroos, American Gold Eagle or Chinese Gold Panda coins due to substantial dealer premiums you are going to incur. So, frankly speaking, American Eagle bullion proof set with its hefty premium charges belongs in the numismatic collection but not your investment portfolio. 4. Depending if a bullion has a legal tender is a major factor affecting its price. Coins that additionally possess legal tender cost generally more than their counterparts. 5. Coin’s weight is also important when it comes to determining bullion prices. Buying coins of lighter weights than standard one troy ounce is going to end up costing you more in premium charges. It’s generally better to stick to 1 oz bullion coins or bars to minimize your investment costs.